MWN Blog: Arctic cold coming to the Mid-South this weekend! It’s a word we haven’t had to use too much this winter, but yes, cold weather is making a comeback to the Mid-South! We had a cool day today as afternoon clouds and a northerly breeze kept temperatures in the 40s, but a true Arctic airmass is expected to move into the Mid-South behind a fast moving cold front on Friday night. In the meantime, after a cold night tonight and another cool day tomorrow, milder weather will make a brief return Friday as highs return to the 50s. However, the change begins by Friday afternoon with the approach of the cold front. A few light showers may break out ahead of it, but significant and widespread rains are not expected. 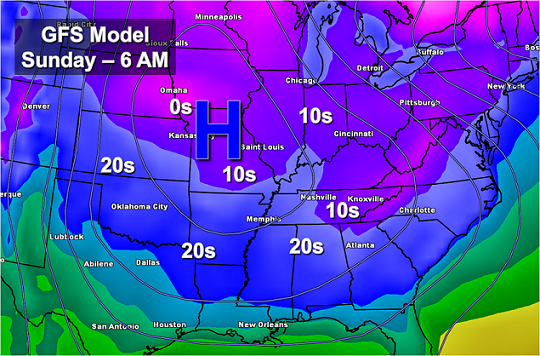 By far, the most noticeable impact will be the much colder temperatures left in its wake for the weekend! As Arctic high pressure builds into the area on Saturday, northerly breezes will make for a very cold day - especially considering the mild weather of the past few weeks! Highs will struggle to reach 40 degrees and many locations may hold in the 30s, with wind chills even colder. As the high moves closer Saturday night, clear skies and calming winds will make the perfect recipe for one of the coldest nights this season so far. By Sunday morning, temperatures in the low to mid 20s will be commonplace, and a few of the far outlying locations in the metro may flirt with the teens! The cold conditions will continue into Sunday as well, but southerly flow will be back in the picture by the start of the new work week, along with a chance of rain, and that will mean the return of the milder pattern that continues to dominate the overall season. By the middle of next week, readings are likely to be back in the 60s, and our next significant chance of rain and thunderstorms (possibly strong) may be on the horizon then as well. Of course, exact details on this system will need to be refined in the coming days, so be sure to stay with MemphisWeather.Net for the latest. 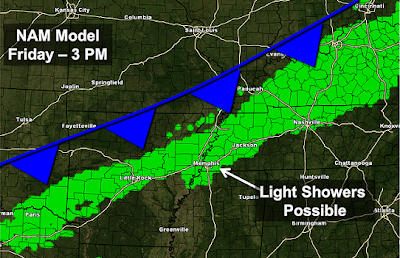 For the most up-to-date outlook for the Memphis metro area, check out the MWN Forecast.